After completing 8 weeks of intensive research on the spectra of distant, cool brown dwarfs, Morehouse Bridge Scholar Christian Aganze presented his results at the 2015 UCSD Summer Undergraduate Research Conference. Chris was able to find several dozen new late M, L and T dwarfs hidden among thousands of galaxy spectra in WFC3 Infrared Spectroscopic Parallel (WISP) Survey data. In many cases, these sources are well over 1000 light-years away, making them some of the most distant brown dwarfs known. Chris joined other members of the Cool Star Lab presenting results on cool brown dwarf spectra, atmospheres and physical properties. 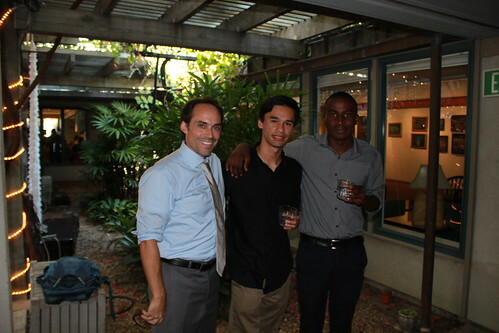 Morehouse Bridge scholar Christian Aganze (right) with Prof. Burgasser and Cool Star Lab colleague Adrian Suarez. Christian’s presentation slides can be seen here. Tagged Christian Aganze, summer undergraduate research symposium.